It was a football night yesterday as we saw back to back encounters which both incidentally ended in defeats. Our NPFL All Stars lost 2-1 to Valencia and Samson Siasia’s heavily depleted squad lost 2-0 to Columbia. But they were pointless defeats, (No pun intended of course cos defeats don’t give anyone any points). But while for the All Stars, it was a brave and gallant display the boys conceding a goal in the closing stages, the dream team themselves already have their feet (and entire body actually) firmly in the quarter finals. Coach Salisu started four of our six who made the trip. Udoji, Akas, Ojo and Osadiaye all got starts while Safe hands Theo and Ezekiel Bassey were on the bench. I think on the night, they all did put in a decent shift. Against a superior opposition on their own turf, it was a torrid start to the game for us. And unsurprisingly, we caved but with just ten minutes played. 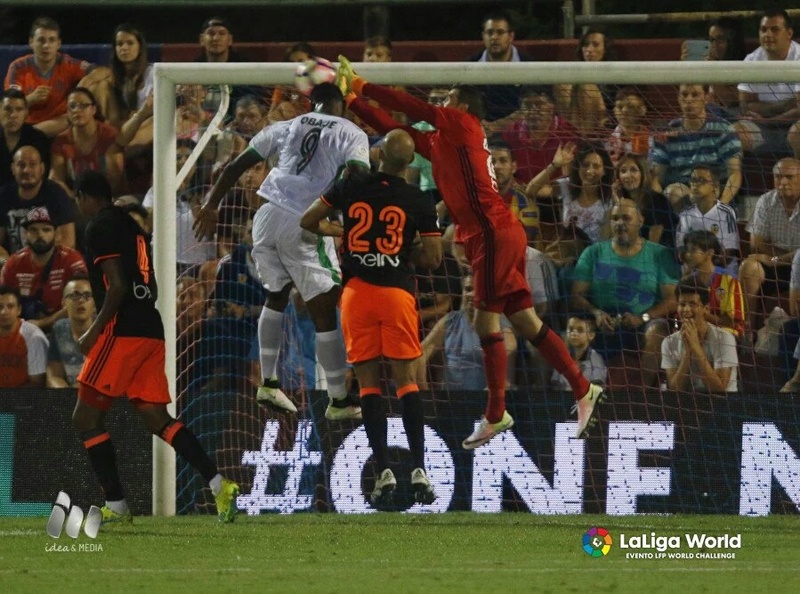 A teasing cross from the left fell kindly for their striker who headed home beyond Ezenwa. The keeper’s decision to come out was made to look silly, leaving his line and not reaching the ball quickly enough. He was caught in ‘No man’s land’ when the ball hit the back of the net. But we responded and it was Osadiaye (who before the time had looked like he would be the one to make something happen) that got us back on level terms. Their keeper fumbled a corner kick and the winger powered home a header that drew us level. The team did grow into the encounter but their hardly was any real attempts at their goal and I’m struggling to remember their keeper making any saves. The problem was that we didn’t do much by way of providing some punch in their half. We defended well no doubt (I think it was the best I’d seen Udoji play in a long long time) but we looked out of ideas when we won back the ball. The coaches thought it best to sacrifice one deep lying midfielder for an attacking minded one. So Dare Ojo was withdrawn for Obinna Nwobodo. A couple of other guys like Ezekiel Bassey saw action late in the second half and the many additions didn’t help our desire to get our game going. We felt a draw was on the cards but our hosts had a different opinion. Some bloke latched onto a long ball that seemed to catch our defence off guard and he buried with aplomb to hand them the victory. In all, a decent time out in the Valencia night and not the humiliation a lot of people thought it would be. The tour would continue with another game tomorrow against Malaga. Perhaps there would be fresh faces and maybe we could get a win, who knows? But I’m much more particular about the impact of this experience on the players. Back home, it’s Zamalek in view. The boys leave for Abuja this morning and could jet out of the country today as well. It’s a game that can turn our season on its head and I’m sure here on the blog, we will be more on that surely, in the days ahead. Please make do with what we have on the menu for today. Previous postWhat if these guys never played for us again?